The MTA and DOT are currently gathering community feedback on the proposed changes to the M14A and M14D bus routes. However, local elected officials have opposed the proposed plan ... and now Community Board 3 is encouraging residents to attend an MTA Select Bus Service Open House on Monday night (details below) to voice their opposition to any plans that eliminate local stops along the M14A/D routes. CB3 is underserved by public transportation, though fewer than 9% of workers in the district use a car to commute to work. Despite CB3 being the third most densely populated community district in New York City, many residents are poorly served by the subway system and 11% live more than a half-mile from the nearest subway stop. • There is a need for more east/west busservice south of 8th Street. The ease of East/West travel has been diminished by the elimination of the Grand Street Bus in the early 1980s and by the limited number of M14A buses. Per a flyer about Monday's meeting via CB3: "We need you to attend the following meeting and say 'NO, we need our local stops.'" This opposition isn't sitting well with NYC Transit President Andy Byford. As the Daily News reported yesterday, Byford "wants the city’s community boards to get out of his way." With the passage of congestion pricing in Albany over the weekend, the self-described railwayman now has a dedicated pot of money to pay for his $40 billion "Fast Forward" plan, which aims to transform New York’s subway and bus networks over the next decade. But in order to get the job done, Byford said he needs the nitpickers and naysayers to keep their typical "not in my backyard" attitude to themselves. "Fast Forward is dead in the water if we have just absolute NIMBYism across the city," Byford said Wednesday at a panel discussion hosted by the U.K. government. "We absolutely have to embrace that if we all want better transit as a system, then we’ve got to think the big picture." "If every single thing we want to do, like speed up buses by taking out just a few stops, gets 'nope, you’re not doing it' (then) I'm wasting my time," he said. "New York City’s bus stops are spaced too close together, which is a big drag on bus riders' time. Some of the current bus stops on the M14 are spaced just one block apart. 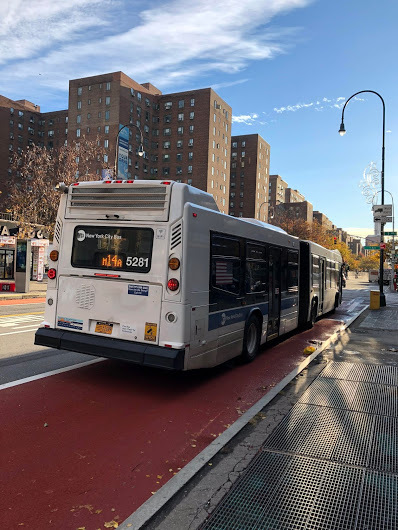 The MTA's bus stop consolidation plan for the M14 will improve transit access in the East Village by speeding up buses, and stops would still be no more than two and a half blocks apart." The MTA Select Bus Service Open House is Monday (April 8) from 6-8 p.m. at the 14th St. Y, 344 E. 14th St. between First Avenue and Second Avenue. Congestion pricing is the gateway tax to unlimited digital human ownership by the State. Every movement into Manhattan is being recorded. It is totalitarianism undreamt of. Ole Lord Cuomo the Impaler slaying sweet liberty. Manhattan the Golden Goose that can't move. Andy Byford needs to (a) shut the hell up, and (b) go back to Toronto. Because he clearly does NOT comprehend how to run the bus system in NYC, and he has clearly NEVER waited in bad weather for 20 minutes for one of the city's buses while carrying heavy packages. The MTA should have ZERO cars/suv's/whatever for its employees to travel around in. Andy Byford, step out of your official MTA car and TRY, just TRY, to get around in this city. And THEN, Andy, take the next plane back to Toronto, and stop thinking you "know" what we need better than we know it ourselves, you carpetbagger. As to Ben Fried's contention that the bus stops are "too close" together, I guess he doesn't know anyone old, disabled, or (again) carrying heavy packages.And I guess he doesn't ever travel in pouring rain or when there's snow/ice on the ground, when every extra step is treacherous. As far as I'm concerned, Fried can take the same plane to Toronto. We have far too many "I've never taken a city bus" idiots who are SURE they know how to fix things - yet they can't even stop fare-beaters from getting on the buses, and they can't fix the doors on the buses so they CLOSE (instead of staying wide open to accommodate the fare-beaters, while coincidentally letting all the heated or air-conditioned air OUT at every stop). I'm not a genius, but I DO ride the subways and buses regularly, and I could do a damned better job sorting the bus service out than the overpaid and snotty Andy Byford. And I bet hundreds of my fellow New Yorkers could do a better job than Byford as well. Byford takes the subway everyday. Twice a day. I think he's doing an excellent job and genuinely seems to care about how he's doing and wants to be accountable. He's not the head of the MTA and can only do so much. @1:46pm: If Byford takes the subway every day, then he needs to get off the subway and get around ENTIRELY by BUS for two weeks - then he might get a clue! And while he's not the "head" of the MTA, he IS "NYC Transit President" and he was brought in with great fanfare as its "savior," which seems not to be the case. Cuomo needs to take the responsibility and the blame for all the crap that is wrong with the subways and the buses - but he can't take the heat; he always deflects, the same way Trump does. And Cuomo only travels to his photo-ops in an SUV-motorcade. PS: I do not believe Byford only travels by subway; I'm sure there's an official city vehicle available to take him around town at any time. Byford knows he can do whatever he wants, and we're at his mercy. The fact is, the M14 bus serves a lot of people who can't easily travel far on foot. If they could, they'd be on the L (or the F)! I would love to have SBS service on the M14 line, but it should supplement rather than replace local service. I know there are routes where this is done. Why are white guys always telling other people what's good for them. Here's an idea: why don't you engage the communities that you are supposed to be serving? That's what's missing from this equation. Maybe, just maybe, the people who have lived here many years, unlike you, could let you know what they need, not vice versa. I've lived across the MTA construction site on 14th St for the 19 months, and I can definitely say that they are incompetent, and could care less about residents or the people they are supposed to serve. They are an unaccountable state entity which shows in how they go about things, and the lack of the consideration they show in their work and planning.